The ultimate protection for ships, harbor crafts, docks, piers and wharves. Constructed with the latest design and material technology. Tough Marine Guard™ netless foam filled marine fenders provide a proven and quality solution in a high performance fendering system. The ultimate protection for ship to ship and ship to dock applications, providing superior abrasion resistance under the harshest conditions. 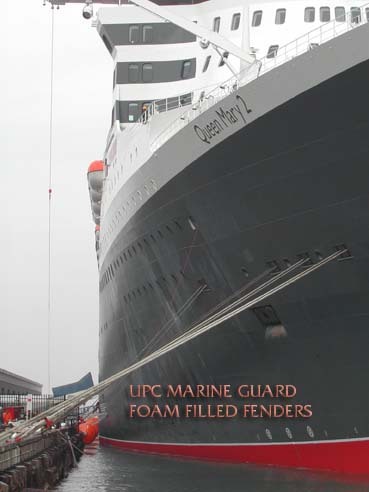 Marine Cushion™ netted foam filled marine fenders are constructed with the same proven quality as our Marine Guard™ netless foam filled marine fenders. The Marine Guard™ donut fender is a foam filled fender which is designed to float on a central stationary driven steel monopile. This unique design enables the donut fender to ride up, down with the tide and rotate freely around the monopile, making it ideal for fendering in areas of large tidal swings, used for corner protection or as a turning dolphin. Marine Guard™ foam filled donut fenders are constructed with the same proven quality as our Marine Guard™ netless foam filled marine fenders. High Performance Cylindrical Submerged and UPC’s Universal Submarine Fender Assemblies marine fenders to be used for the protection of submarine and surface ships, harbor craft, wharves and piers from damage due to vessel maneuvers where vessel-to-pier or vessel-to-vessel contact may occur. They are mobile and designed to accommodate various submarine sizes.